Winning the Diversity Leadership Award at the Yorkton Chamber of Commerce 2016 Celebrate Success Business Awards in April is the latest recognition in a string of awards that TA Foods Ltd. has earned during a period of intense growth. The Yorkton-based food processor was the recipient of the Growth & Expansion Award at the Saskatchewan Chamber of Commerce 2015 ABEX awards last October. The company had also been named finalist in the Exports and Innovation categories. TA Foods specializes in supplying cleaned flaxseed, milled flax and flax oil to bulk and retail markets throughout Canada, the US, Mexico, and Asia and is now offering copackaging/production services to companies requiring custom oil pressing, bottling, and packaging. The Growth & Expansion award was “an awesome honour,” says Mike Popowich, co-owner of the family operated business. “It’s amazing how much an award like that helps the company gain recognition in the international community. The award recognized the work that TA Foods had accomplished as a result of facility upgrades completed three years ago, when the company added a cleaning plant and bottling line, Popowich says. “With the addition of our high capacity crushing area, we were able to do a lot more flax oil per day than we were able to do before, and with the addition of a bottling line being able to offer a private label to customers,” he adds. One particular innovation that Popowich is proud to point out is the company’s success in improving the “smoke point”—the temperature at which bluish smoke starts to form, indicating the destruction of beneficial nutrients and the creation of harmful free radicals—for its flax oils. Flax oils have a reputation for easily oxidizing, he says, resulting in a low smoke point, a little over 100 degrees Celsius. “But with the flax oil that we produce here it's between 180 and 200 degrees Celsius, similar to an olive oil. So we can recommend our flax oils for baking and for stir frying." 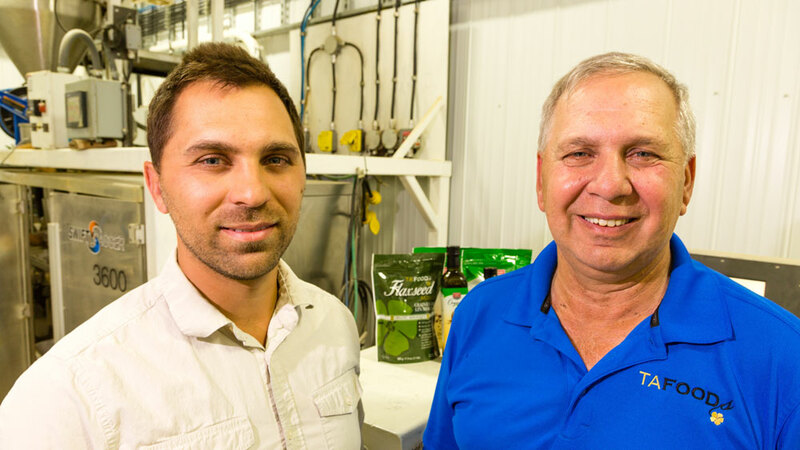 Innovation has always been a driving force behind the Popowich family. In the 1980s, Mike’s parents, Terry and Ann, established a seed-cleaning plant on the family farm south of Orcadia, purchasing grain from local farmers, then distributing the cleaned grain to processors and end users. By the late 1980s, the family opened Popowich Milling, with its main facility just beyond the northern outskirts of Yorkton. e family sold Popowich Milling to Grain Millers in 2002. In 2003, recognizing the vast potential for value-added production of market-ready products for consumers, the family launched TA Foods Ltd.—the T and A standing for Terry and Ann. Starting from a single employee, they quickly grew to establish a headquarters and main production facility on Yorkton’s downtown edge, in a building that they purchased after having sold it to Grain Millers only a year previously. Mike Popowich and his wife Lana joined the family business as co-owners in 2013. About 50 per cent of the company’s revenues come from its retail products, Popowich says. In addition,TA Foods supplies flax, milled flax and bulk oil as blends or ingredients used in familiar brands of granola and health foods. “As a food product, it has been growing more and more with the health food industry. With high Omega-3s, Omega-6s and Omega-9s in the product, it’s very healthy. Worldwide, interest in flax products has been growing steadily for the last decade, Popowich says. The company exports mainly to China, Japan, Taiwan, South Korea, Ireland, Mexico and the US. "Most of our future focus for the business is on the retail side,” he says, noting that the retail market is primarily overseas, whereas the US market tends toward bulk ingredients. Although TA Foods markets under its own brand, familiar to grocery shoppers throughout Canada, Popowich says the company also bottles and packages more than 30 private labels currently. The company purchases almost all of its conventional flax from Saskatchewan farmers, many of them in the Yorkton region. For its organic flaxseed, the company looks a little wider, Popowich says, buying from producers in Alberta and Manitoba, as well. Popowich notes that TA Foods meets the rigorous standards of Global Food Safety Initiative (GFSI)—Safe Quality Foods Program (SQF), Hazard Analysis and Critical Control Point (HACCP), Good Manufacturing Practice (GMP), Pro-Cert Organic, Non-GMO Project, Kosher and Gluten Free certifications. “Canada is the world’s largest grower and export of flax in the world,” Popowich says.